The Rye Arts Center Benefit Concert & Party will be a celebration of music in the community, headlined by Juice, a band with a national audience and local ties. Guests will be greeted by the music of Rye High School’s a cappella group, Rhythm on Rye, who will set the tone for the evening. While enjoying an array of food stations and hors d’oeuvres, attendees will be treated to a performance by the Rye High School Jazz Ensemble. Next up, the Urban Coyotes are guaranteed to bring a crowd to the dance floor. They are a five-piece rock band made up of Rye residents and others from the region. They play “rock, twang, folk-grass blues”, drawing on soulful styles from New Orleans to Memphis to Portland. Blending gritty, electric instruments with mandolin, banjo, harmonica and acoustic guitar, the Urban Coyotes perform original music and their own interpretations of Americana classics. The evening will culminate with a performance by the festival-winning band: Juice. 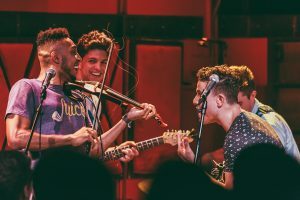 With seven distinct personalities, Juice distills Rock, R&B, and Hip-Hop into a signature sound with a distinct kick of electric violin, rich harmonies, honest lyrics, and festival-worthy choruses. The band’s drummer, Miles Clyatt, is a Rye native, who took his first drum lessons at The Rye Arts Center. Local audiences may know them from performances at the Capitol Theatre and The Pleasantville Music Festival. The are currently on a nationwide tour that kicked off last summer with an appearance on The Today Show. Back by popular demand, this is Juice’s second year performing at The Rye Arts Center’s Benefit. The event will be hosted by local comedian and radio host, Kim Berns, who can be heard each week on Anything Goes with Kim Berns, on 1490 WGCH. Fans of The Rye Arts Center know her well as the perennial host of Ladies Comedy Night. The Benefit Committee is being chaired by Nicole & Keith Cunningham, Michelle & Christopher Froah, Susan and Yong Gao, Claire & Michael Griffiths, and Suzanna and Andrew Keith. Funds raised from the event will support The Rye Arts Center’s many outreach programs, such as Head Start arts enrichment, which provides 315 under-served pre-school children with arts education; after-school programs at partner organizations like The Community Resource Center, The Don Bosco Center, and The Boys and Girls Club of Greenwich; Dance for Parkinson’s Disease, free classes throughout the year that provide a supportive community and a rejuvenating experience for people suffering from Parkinson’s Disease; a Girls Who Code Club, and $25,000 in need-based scholarships. The Benefit Concert & Party is made possible through the generous sponsorship of Julia B. Fee | Sotheby’s International Realty and TD Bank. The Rye Arts Center is seeking additional sponsors, advertisers in their printed journal, and donations for an online auction. All support directly impacts their outreach programs. Get tickets online or call (914) 967-0700. This entry was posted in Press Releases and tagged Concert Rye Music. Bookmark the permalink.